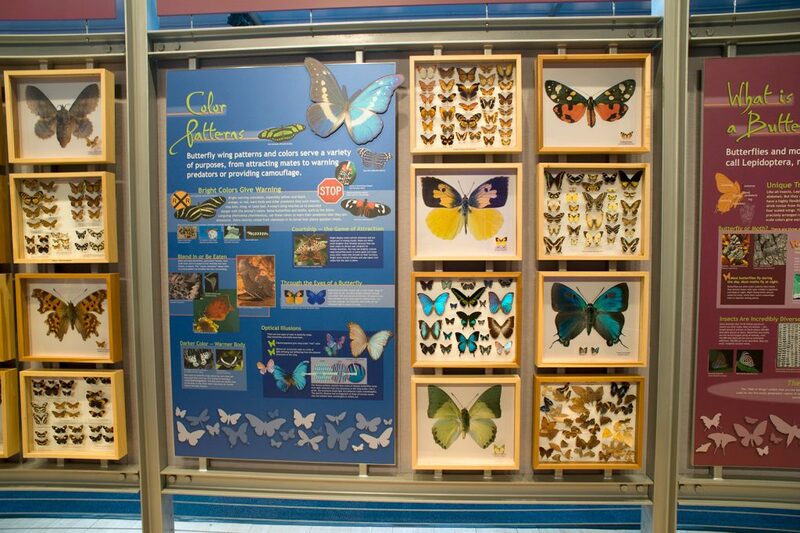 A variety of exhibit experiences inside the museum bring the science behind this fascinating group of insects to life, starting with “What is a Butterfly?” and ending with conservation issues worldwide. 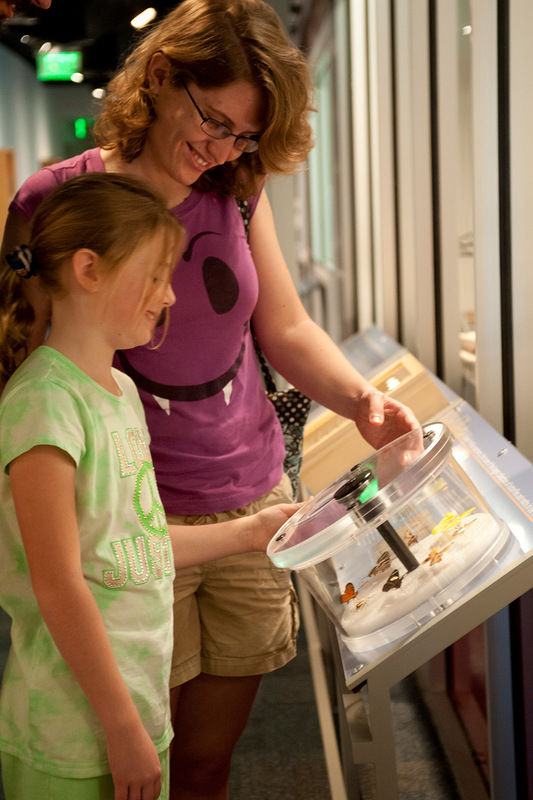 The rearing lab gives you a closer look at the life cycle of the butterfly, from egg to larva to pupa. There are interactives with our labs that show more about genetics research, morphology studies, specimen preparation, scanning electron microscope work, species conservation. Watch and interact with Butterfly Rainforest staff as the hundreds of new pupae that arrive each week are unpacked, sorted and placed in large window cases. This wall, nearly three stories high, showcases thousands of butterfly and moths specimens and photographs. 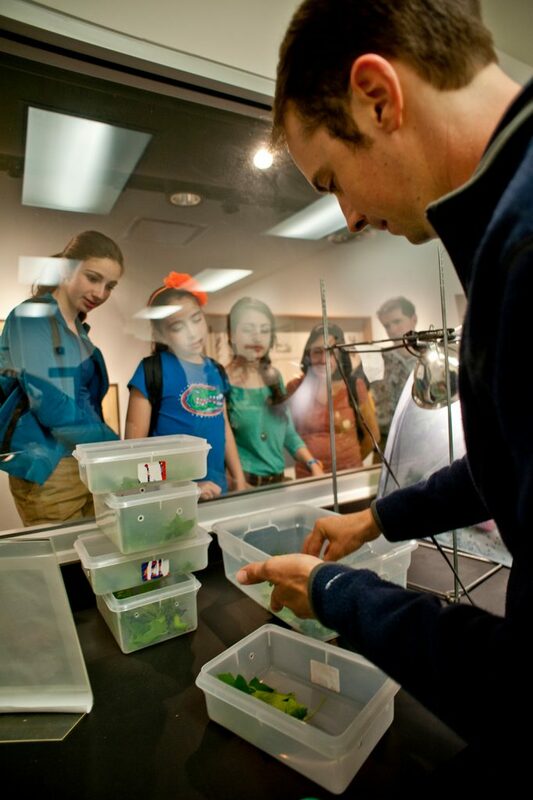 The rearing lab gives you a closer look at the life cycle of the butterfly, from egg to larva to pupa. Watch and interact with Butterfly Rainforest staff as the hundreds of new pupae that arrive each week are unpacked, sorted and placed in large window cases. If you play close attention, you just may see a beautiful new butterfly emerge! 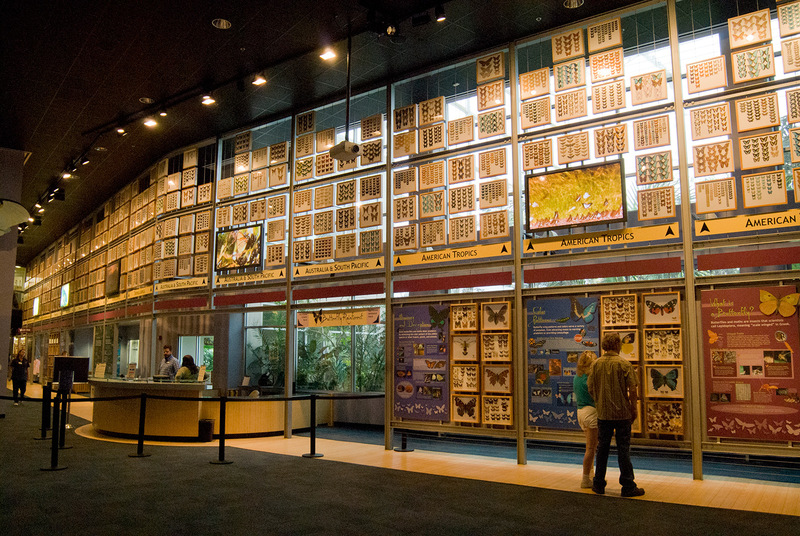 This wall, nearly three stories high, showcases thousands of butterfly and moths specimens and photographs. These specimens, arranged in the same boxes used to store the research collections, convey the breadth of this world-class collection, the excitement of scientific discovery, and the beauty and importance of biodiversity. Lepidoptera contribute in many ways to our understanding of the world, from indicating the health of our planet to charting the path for certain advances in human medicine. Follow the studies of University of Florida and other scientists through our stories about Lepidoptera research worldwide. 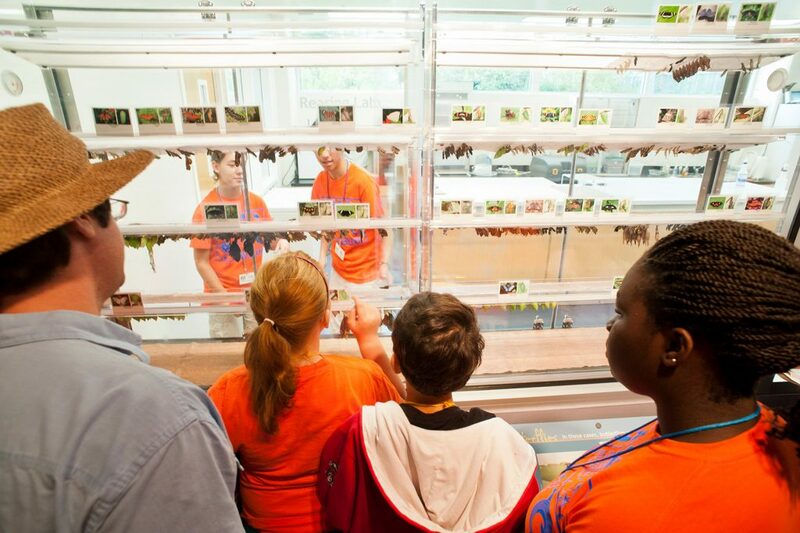 Get a close-up look at the world’s largest research facility devoted to Lepidoptera housing more than 10 million specimens (and growing). Peer through laboratory windows to watch museum scientists at work. Individual labs feature genetics research, morphology studies, specimen preparation, scanning electron microscope work, species conservation and more. At more than 10 million specimens, this is one of the world’s largest Lepidoptera collections. There is space to expand the collection up to 20 million specimens. The three floors of collection rooms are filled with compactor units that hold a total of about 100,000 drawers. Each collection drawer may hold as few as 4 large specimens (Giant Goliath Birdwings) or as many as 2,000 microlepidoptera moths. The collections are the foundation for innumerable research studies that directly contribute to a greater understanding and appreciation of our natural world.